Read this outrageously intertaining story of a tough Icelandic woman, HERE. Æthelred the Unready became king of England in 978, following the assassination of his brother, King Edward the Martyr. 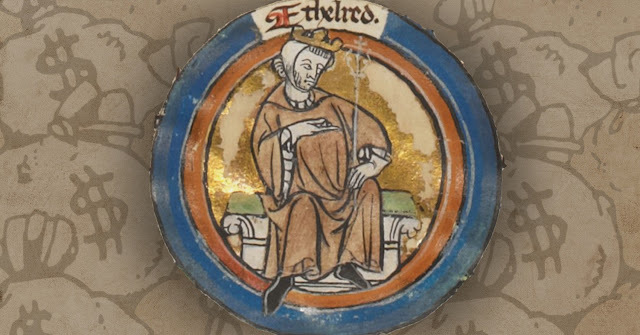 Æthelred was reportedly only ten years old when he ascended to the throne, and his epithet, Unready (Unraed), actually meant “bad counsel,” as the young king’s regent, advisors and vassals gave him little sound support during his life. 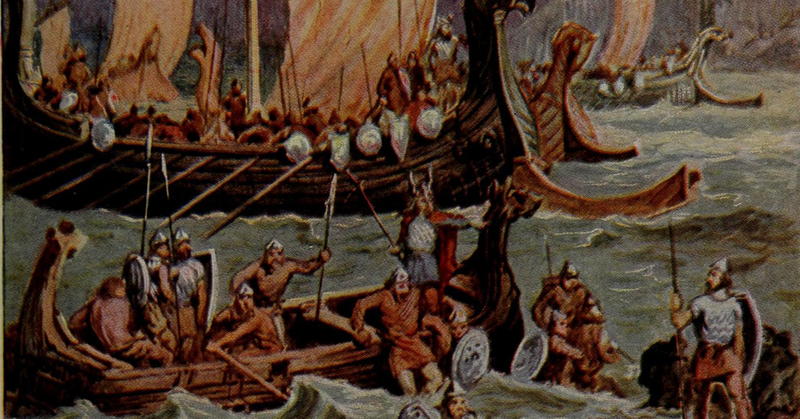 Yet, the modern definition of unready also fits King Æthelred, for when a relentless wave of Viking activity began plaguing England in 980, the king and the kingdom were caught totally unprepared. Continue reading about the enormous sums that Æthelred the Unready paid to the Vikings, HERE. The heyday of the Viking age occurred between the eighth and eleventh centuries. Yet, some Scandinavian noblemen continued to embark on Viking-like activities well into the twelfth century. Jarl Rognvald Kali of Orkney (r. 1137-1158) was one such nobleman and he ironically was said to have gone raiding in the Mediterranean while on a pilgrimage to Jerusalem. The Viking Age is a well-documented period, with sources from multiple sides and viewpoints. Viking Age kings wrote about their accomplishments on stone monuments, and historians such as the Icelandic Snorri Sturluson (c. 1179-1241) and the Danish Saxo Grammaticus (c. 12th-13th century) later narrated events from the perspective of Norway and Denmark. There are also substantial sources from the regions attacked by Vikings, such as chroniclers based in the British Isles and France. With such a wealth of information, much is known about the key figures from the Viking Age and their exploits during that chaotic time. Yet, Viking Age Scandinavians did not excel at only daring raids and bold seamanship—they also had some of the most creative names in all of Europe. We previously published an article listing ten fun and unique names from the Viking Age, yet that was barely scratching the surface. Here are ten more fun names and a brief summary of their lives in the Viking Age. Check out our new and improved list of extra Viking Age names, HERE. Emperor Jing (r. 157-141 BCE) and the concubine Lady Cheng had three sons named Liu Yu, Liu Fei and Liu Duan. All three brothers were quickly appointed as kings after their father’s ascendance to the throne. Liu Yu and Liu Fei were given kingdoms in 155 BCE and Liu Duan followed close behind with his appointment as the King of Jiaoxi in 154 BCE. Lady Cheng’s sons were generally well behaved when it came to respecting the authority of the emperors—they never rebelled and they had largely tranquil reigns. 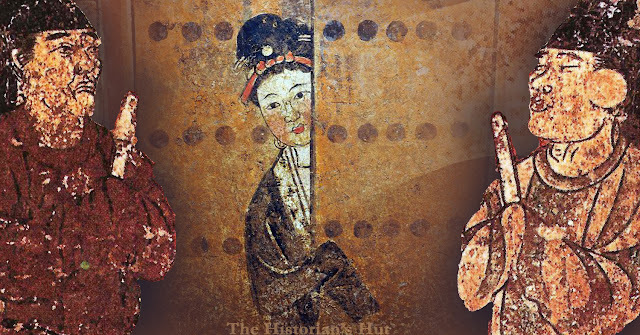 Liu Yu and Liu Fei both died after twenty-five or twenty-six years of rule, which had been tame and peacefully absent of drama. 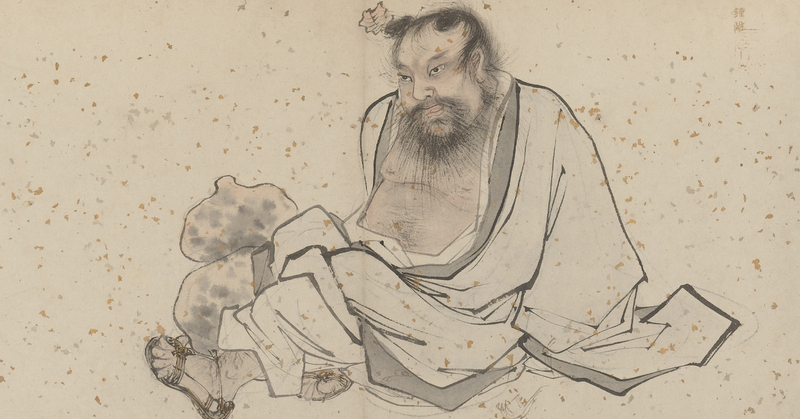 Liu Duan, however, who lived to rule twice as long as his brothers, quickly became the oddball of the family. Liu Duan set up his regime in Jiaoxi like any other king. He hired an entourage of ministers and attendants to help govern his kingdom, and he also took in several concubines who would hopefully provide him with an heir to the kingdom. Yet, Liu Duan and his ministers quickly began to feud. The main point of dissent, according to Han historian Sima Qian (c. 145-90 BCE), was the relationship between the king and his concubines—or lack thereof. Apparently, Liu Duan was strictly homosexual and used every trick in the book to avoid time with his palace women. His favorite ploy was to plead illness, a tactic that allowed him to escape his concubines for months at a time. Continue reading about the interesting life of King Liu Duan, HERE. 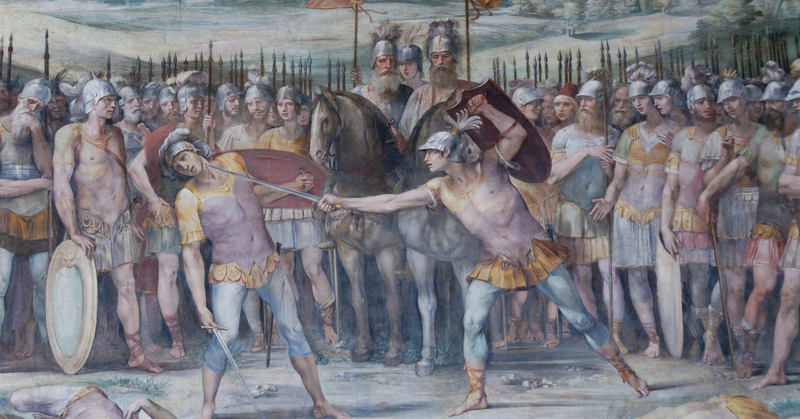 Continue reading about the disturbing and tragic tale of the Horatii and the Curiatii, HERE. 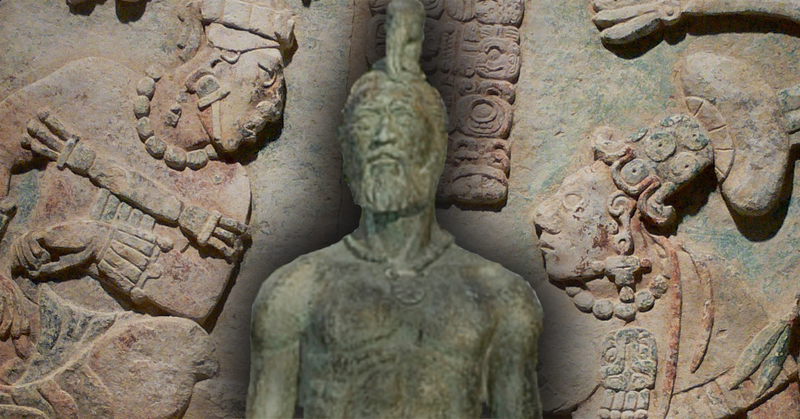 A large canoe appeared before Hernán Cortés at Cozumel. Seven people disembarked from the canoe, and the Conquistadors, after some double-takes and closer inspections, realized that one of the seven new arrivals was Spanish. Bernal Díaz described the man’s state: “He wore a very ragged old cloak, and a tattered loincloth to cover his private parts; and in his cloak was tied an object which proved to be a very old prayer-book” (The Conquest of New Spain, chapter 29). 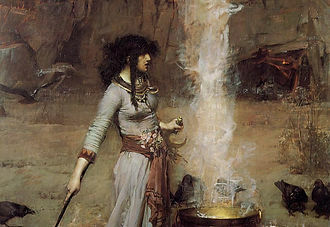 Upon reaching the Conquistadors, the man loudly exclaimed in Spanish a prayer to God and “the blessed Mary of Seville,” which convinced Cortés and the explorers that the man was truly a Spaniard. After giving the man new clothes, Hernán Cortés debriefed him for information. The man claimed that he was a priest named Jeronimo de Aguilar and that, in 1511, his ship had run aground on a sandbar or shallow water somewhere between the colony of Darién, Panama, and Hispaniola. Aguilar stated that he and seventeen other people on the shipwrecked vessel loaded themselves into a rowboat and attempted to paddle to Cuba or Jamaica. Yet, storms and strong currents forced the small boat to a Yucatan beach, where a local Mayan chieftain captured the stranded Spaniards. Most of the captives reportedly suffered horrible fates. Some were said to have been killed in ritual sacrifice, and others were worked to death as laborers. Yet, Aguilar and other survivors eventually escaped and found shelter in more lenient Mayan communities. By 1519, only two of the original eighteen captives were still alive—Jeronimo de Aguilar and another man by the name of Gonzalo Guerrero. Continuew reading about the tale of Gonzalo Guerrero and the way Spain learned of his supposed existence, HERE. In China during the 2nd century BCE, there lived an interesting fellow named Zhou Ren. He hailed from the region now known as Jining, Shandong, and through unknown means he managed to ingratiate himself into the imperial court of Emperor Wen (r. 180-157 BCE). While Emperor Wen was still alive, Zhou Ren became a palace counselor and joined the retinue of the imperial heir apparent, the future Emperor Jing. Before the ascendance to the throne of Emperor Jing (r. 157-141 BCE), Zhou Ren became one of the new emperor’s closest and most intimate friends. Almost immediately after Jing became emperor, he appointed Zhou Ren to be the chief or chamberlain of all the palace attendants—a position Zhou Ren would hold for the remainder of the emperor’s reign. Continue reading about the life (and odd wardrobe) of Zhou Ren, HERE. 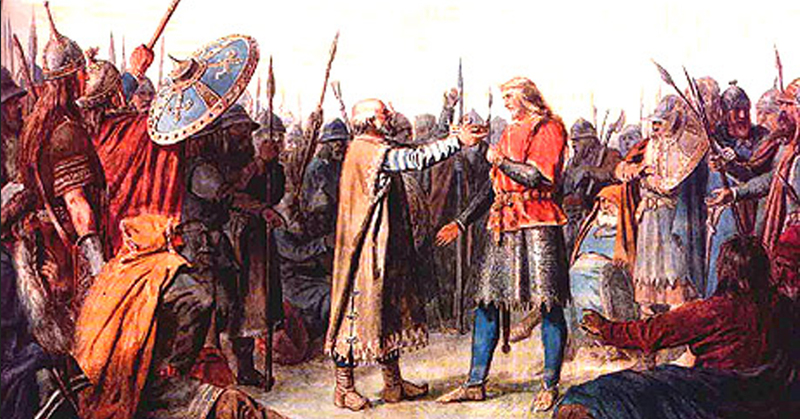 Around 1098, the Norwegian crown placed Orkney under direct royal control, but Hakon Paulsson, the son of a formal jarl of the region, was appointed to govern Orkney within a year or two after Sigurd the Crusader became king of Norway in 1103. Jarl Hakon Paulsson was portrayed as a willing retainer of the Norwegian kings in the Orkneyinga saga. Yet, Hakon had a cousin called Magnus Erlendsson who was less enthusiastic about being ordered around. Instead of behaving like Hakon Paulsson and serving his Norwegian liege, Magnus Erlendsson fled to Scotland and found shelter with King Edgar (r. 1097-1107). Magnus’ stay in Scotland, however, was only temporary and he decided to return home not long after Jarl Hakon Paulsson was appointed as jarl of Orkney. Like Hakon, Magnus Erlendsson’s father was also a former jarl of the islands and he intended to press his claim. 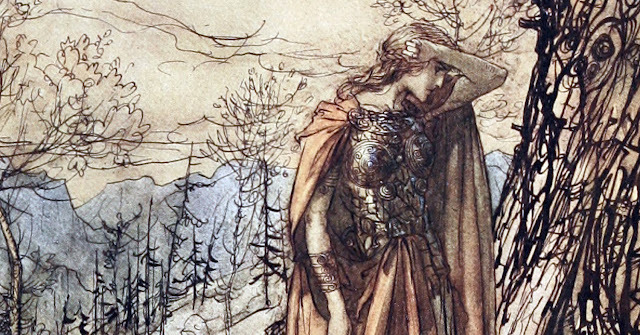 Multiple jarls coexisting in Orkney was nothing new—according to the Orkneyinga saga, the practice of dividing the governance of Orkney into halves and thirds was at least a century old by that time. When Magnus Erlendsson arrived in Orkney, he had powerful friends that flocked to back his claim, and the island population seemed accepting to the idea of a second jarl. Hakon Paulsson was undoubtedly less than enthusiastic about sharing power with his cousin, but he was convinced to accept the Norwegian crown’s decision on whether Magnus Erlendsson should become a jarl. The claimant sailed to Norway around 1107 and, to Hakon’s disappointment, Magnus Erlendsson was recognized as a rightful jarl of Orkney. Continue reading about the life, martyrdom and supernatural revenge of St. Magnus, HERE.